There is, of course, considerable interest is estimating the quantity of food required or consumed by an elephant daily (table 5.1). There are several ways of empirically determining this figure. The stomach contents of dead elephants can be weighed and the daily consumption calculated from knowledge of the rate of passage of food. Richard Laws and his team made several calculations of food consumption by elephants in Uganda by weighing stomach contents of a large sample of culled elephants at Murchison Falls National Park. Using a passage time of 12 hours, they initially concluded that adult males consumed 4.8% and adult females 5.6% of their body weights as fresh fodder daily. These figures were later revised to 4% of body weight for elephants of all age classes with the exception of lactating females, for which a much higher figure of 6% of body weight was computed. Thus, an adult bull weighing 6,000 kg would consume 240 kg, and a lactating female weighing 2,700 kg would eat 162 kg of fresh plant material each day. If one were to make adjustments for the moisture content of plants, the dry matter of plants would reduce to only 1% of body weight for most elephants and 1.5% for lactating females. Feeding rates and forage intake in African and Asian elephant populations. The trunkful weights for Amboseli are for grass and browse, respectively. B, browse; D, daytime; DM, dry matter; F, female; G, grass; M, male; T, 24 hours; WM, wet matter. day and at night to determine the time spent in feeding over a 24-hour period. There may be active and more passive phases of feeding in which feeding rates differ. The weight of a trunkful of forage may vary between grass and browse and from one season to another. Nevertheless, many observers have made such estimates based on partial or complete information. A related way of estimating food quantity is to find out the rate of defecation by elephants and weigh a sample of droppings or collect and weigh all droppings over a 24-hour period. A correction has to be made for digestibility of the plants consumed. In F. G. Benedict's classic physiological study of a female Asian elephant named "Jap" published in 1936, the average weight of feces over a 9-day period was 25.8 kg dry weight per day. This 3,672-kg animal had consumed 413 kg of dry hay over this period or 45.9 kg/day. This implied a daily consumption of 1.3% of body weight as dry fodder and an assimilation efficiency of 43.8% for hay. Controlled experiments by Tom Foose on digestibility in two Asian and three African zoo elephants, using timothy hay and alfalfa (lucerne), yielded similar values. Such high digestibility, however, is unlikely under natural conditions. The forages used in these experiments were high-protein, temperate C3 grasses, while elephants in the wild would be mostly consuming lower-quality tropical C4 grasses. Some digestibility trials by R. A. Rees and field estimations by Richard Ruggiero on African elephants indicate digestibility of only 18%-23% of dry plant matter. Estimates of food intake by elephants based on weights of feces thus have to contend with different digestibility of forage, depending on plant type, parts, and even season. If we assume a body weight of about 1,400 kg for "Eleanor," the 10-year-old female African elephant studied by Malcolm Coe, the 25 kg of dry feces (100 kg fresh weight) it evacuated daily translates into 2.4% of body weight consumption, assuming 25% digestibility of forage eaten. 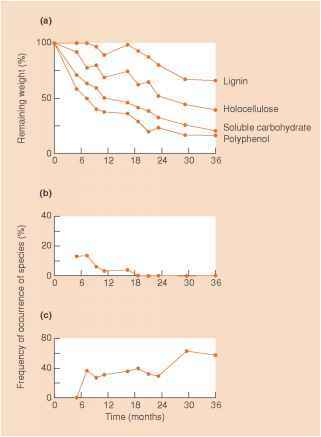 Several others have estimated weights of elephant droppings, but these figures cannot be expressed as forage intake in relation to animal body weights. Observations of time-activity budgets of elephants indicate that they may spend anywhere between about 40% and 75% of their time in feeding. Peter Guy recorded that both sexes at Sengwa spent only about 41% of their time in foraging during the dry months, a figure that rose to 57% during the wet period. His figures, however, were extrapolations from daytime observations. J. R. Wyatt and S. K. Eltringham followed seven elephants continuously over 24-hour periods at Rwenzori National Park in Uganda. They found that these elephants spent three-fourths of their total time in feeding, with three activity peaks—one in the morning, another in the afternoon, and the third around midnight. The detailed observations of Keith Lindsay at Amboseli also suggest that elephants may overall spend 70%-75% of their time in feeding. The studies of George McKay and B.W.B. Vancuylenberg in Sri Lanka reported even higher figures (up to 94% in males), but these refer only to observations made in open areas when elephants were actively feeding and do not reflect either diurnal or 24-hour feeding budgets. A comparison of feeding rates among different populations suggests that African elephants feed more rapidly (i.e., transfer forage more often to the mouth with the trunk), but that they take in less per trunkful compared to Asian elephants. The lowest rates of 1.5 trunksful per minute recorded at Sengwa and Amboseli are close to the highest rates (1.6-1.7 trunksful/minute) recorded in Sri Lanka or India when observations were made of elephants actively feeding on grass. African elephants feed as rapidly as 5-6 trunksful/ minute. On the other hand, the quantity of grass per trunkful is substantially higher in Asian elephants (58-77 g) compared to African elephants (10-25 g). When these are translated into daily intake expressed as a percentage of body weight, the range of values is very similar. Elephants in both continents seem to consume between 1.5% and 2.0% of their body weight as dry forage each day. I have also pointed out that Asian elephants can comfortably achieve this level of intake in just 12 hours at normal rates (0.8 trunkful/minute) of feeding. When feeding on cultivated grasses such as paddy or millets, they can consume this amount in just 6-7 hours of feeding. It is thus possible that, if elephants were to spend over half their time in feeding, they could be consuming higher quantities, as proportions of their body weights, than suggested by most studies.